Are you planning a winter vacation to Branson? Grand Country can entertain you, feed you, and lodge you for as long as you can stay. Stopping in Branson on your way to Arizona for the rest of the winter? Stay at Grand Country for grand lodging, food, and shopping … and you’ll want to catch a grand show there before you leave. Bringing the whole family to Branson for a long weekend or winter break? 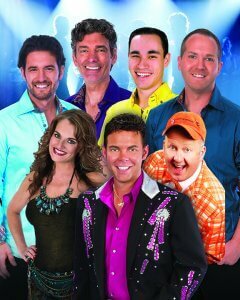 Grand Country will provide the whole family with a grand time in Branson! Splash Country at Grand Country Inn! First of all, it’s winter. It’s cold. If expensive ski trips or trips to really cold destinations are not your idea of fun, well, let me tell you about all the outdoor fun you can have indoors at Grand Country. That’s right, golf, go-karts, arcade, Splash Country Water Park — this water park is phenomenal, with tubing on the lazy river, tube slides, a three-level tree house with water adventures on each level; and this year there are two new slide adventures — Big Dip Drop and Highwall Heights. There are nine attractions at Splash Country. And two hot tubs, one for children and one for adults! There’s so much available at Grand Country that it takes care of most things on your “what I want on a vacation” check list. Grand Country has long been known for excellent talent and shows. The musicians in the shows here are some of the finest anywhere. I started working and writing in Branson in 1990. Over the years I’ve become acquainted not only with our local musicians but also world-famous entertainers, who often told me what extraordinary musicians they think we have here in Branson. Grand Jubilee, Comedy Jamboree, and Amazing Pets are just three of the shows on stage at Grand Country. Grand Jubilee is in its 17th year and is always, always an exciting and fast-paced show. I love their song selection — Top 40, Country and Gospel classics, and classic rock ‘n’ roll hits. One of my favorite songs, The Church on the Cumberland Road, is their opening song. And I especially love Mike Patrick’s Great Ball of Fire! Mike is a great entertainer, a Branson favorite. He is also the producer and director of Grand Jubilee. He’s a classic straight man for comedian Jamie Haage, aka Jim Dandy. Together with female vocalist Jackie Brown, New South Gospel Quartet, and the outstanding musicians in the Rhinestone Mafia Band (love it! ), it’s a show that entertains audiences of all ages. Guaranteed. Comedy Jamboree always has audiences laughing their socks off, with great gags, colorful characters, comedy from clever to slapstick. There’s great music and dancing, too, from the Jamboree Singers, pianist Tracy Heaston, and the Grand Band. Aside from the entertainment on stage at Grand Country, there is an abundance of fun and activity with all the outdoor-fun-indoors! An indoor go-kart track; bumper cars; the Fun Spot, which offers mini-bowling, arcade games, laser tag; three mini-golf courses. The 36-hole Grand Country Indoor Mini-Golf was named by USA Today as “one of the top ten miniature golf courses.” It’s a climate-controlled course set among rivers, with an Ozarks Rainstorm every 30 minutes! 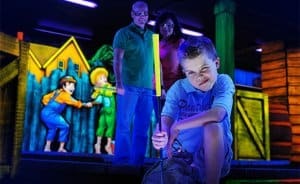 Black Light Mini-Golf has riverboats, a lot of special effects and animation. And you’ll feel like you’re back at Grandma’s at Farm Mini-Golf, complete with life size whimsical and animated farm animals, a horse barn … even sound effects! Besides the two new slide adventures in Splash Country, there’s Grands Fort, an indoor tree house with water slides; Froggy Bog; Crosscut Falls; Melting Pot Hot Tubs, one for kids and one for adults. And lots more water fun to be had in Splash Country! Lodging at Grand Country Inn has the unique offering of Kid’s Clubhouse rooms. These rooms have a King or Queen bed AND the clubhouse with bunk beds. Now that’s a grand idea! The dining selections are delicious and fun. There’s the Grand Country Buffet, Papa Grand’s Pizza, Mining Company Grill inside Splash Country, and Minnie’s Camper — fair style food under the glow of neon lights at a 1950’s vintage-inspired camper! If you “nose” around a little you might find some chocolate, too! And shopping! The Gift Shop in the large lobby area is filled with Branson souvenirs, themed items, toys, many fun things for yourself and your friends. Bitz of Glitz dazzles the ladies! It’s a “high-end, Las Vegas type” boutique with distinctive jewelry items, clothes, and accessories. They’ll entertain you, feed you, give you rest … Grand Country Inn is the perfect respite for you this winter. Enjoy!